Step 1 Bring the vegetable stock to a simmer in a saucepan over medium heat. Heat 1 tablespoon olive oil in a skillet over medium heat. Stir in the couscous and cook and stir until golden brown, about 10 minutes. Stir the toasted couscous into the hot vegetable stock and return to a simmer. Cover and cook until the stock has been absorbed into the couscous, about 15 minutes. Scrape into a mixing bowl, fluff with a fork, and allow to cool to room temperature. Step 2 Place the basil, parsley, garlic, oregano, thyme, and olives into a food processor; pulse until the herbs are coarsely chopped. 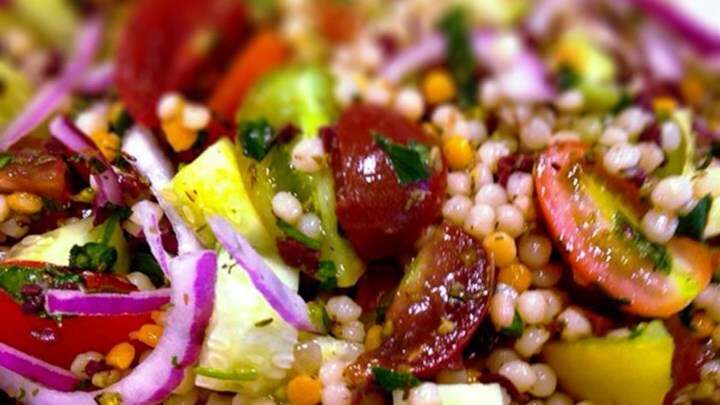 Stir the herb mixture into the couscous along with the heirloom tomatoes, cherry tomatoes, cucumber, red onion, and feta cheese. Drizzle with the vinegar, 1/2 cup olive oil, and lemon juice. Stir until evenly combined.